This is an easy 2nd step. Right here, you can immediately make a big difference to your diet by choosing whole-grain options the next time you go grocery shopping. Examples are brown rice, whole wheat flour, bran, whole wheat tortillas, whole-grain pasta and whole-wheat breads or bread products. The increase in nutrient and fiber content in these alternatives will help to keep you fuller after meals and cause your blood glucose levels to rise less dramatically post-meals. For instance, 1 cup (85 grams in weight) of whole grain pasta contains as much as 3 times the fiber content and slightly more protein and iron than an equivalent cup of white refined pasta! Another example are bagels. A regular bagel will provide approximately 2 grams of fiber but a whole wheat bagel can provide as much as 7 grams of fiber so more than three times the amount! If you are worried about the cost factor, there are a few ways to get around this. 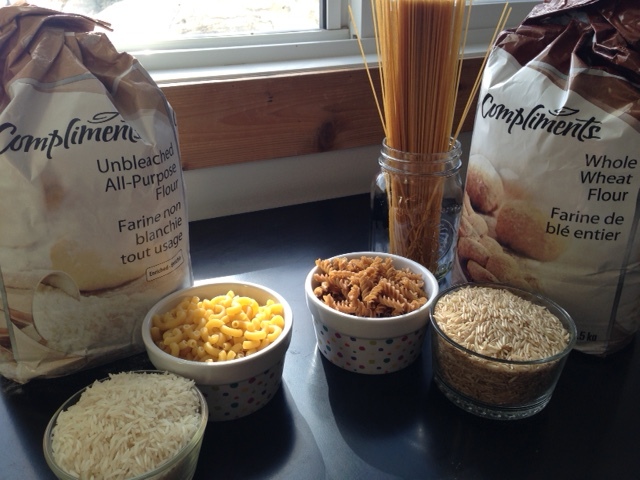 Buy and store up larger packages of whole grain pasta if brands carry a larger more economical packaged option, or purchase the regular sized packages at larger grocery stores where the prices tend to be lower. Another idea is to keep your eye out for discounts and sales at your local grocery store and stock up when the prices drop (but take note of expiry dates!). A note about rice: when purchasing rice, be careful to note the country and place of origin due to the varying levels of arsenic found in rice grown in different parts of the world. To reduce one’s intake of arsenic, rice from California in the United States and India are generally among the safer options to purchase, but it is best to avoid rice grown in the southern part of the United States. There are also ways to cook the rice to reduce the arsenic content within it. A recent news article brought attention again to the arsenic content within rice and the importance of being careful of your method of cooking to reduce arsenic levels. See also my previous articles on this important subject [Arsenic & Rice (Part 1): Why this Affects You and Your Family, Arsenic & Rice (Part 2): Action Steps You Can Take Right NOW, Arsenic & Rice (Part 3): What Are Others Saying About It?, How Can I Reduce The Arsenic Content of Rice Through Cooking? ].